SAN JOSE — Over $1,000 was raised on April 28 at the Nikkei Matsuri information booth in San Jose Japantown to support the Madei Project. 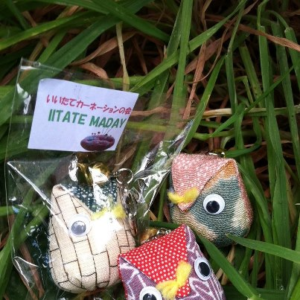 Owls created by the Carnation Club of Iitate. The project supports a group of crafters from the village of Iitate in Fukushima Prefecture. Even though Iitate is outside of the contamination zone, the residents were forced to evacuate due to their proximity to the Fukushima nuclear reactors. With the loss of their homes and their farms, the question was how to create a new life. The ladies of Iitate formed a group called the Carnation Club, whose goal was to establish a new livelihood by making crafts from donated kimono from throughout Japan. A majority of the crafts focus on the owl, a good luck symbol. In Japan, owls are believed to protect one from suffering. This originates from the Japanese word for the owl, fukurou. Fuku means “luck” and rou is “protection from hardship.” With this play on words, owls are commonly seen on good luck charms or figurines in modern Japan. Since 2011, the Nikkei Matsuri has supported a variety of activities to help the survivors of the earthquake and tsunami in northeastern Japan. Just months after the disaster, a raffle was held during the festival to support the AMDA (Association of Medical Doctors of Asia of Okayama), which provided assistance to the Tohoku region. Nikkei Matsuri also allowed the sales of eco-friendly dog toys for the National Search Dog Foundation, which assisted in looking for survivors immediately after the earthquake. Funds were raised through Biscuits-Give a Dog a Bone Dog Boutique and “Aloha for Japan” T-shirts, a Hawaii fundraiser held through Nikkei Traditions of San Jose Japantown. Last year’s Nikkei Matsuri hosted a jazz concert featuring Ayako Hosokawa, with a portion of the proceeds directed to the Northern Japan Earthquake Relief Fund, which is administered by the Japanese Cultural and Community Center of Northern California. The San Francisco-based JCCCNC has distributed over $4 million in direct funds to relief efforts.